This is a tricky but essential subject and it’s hard to know where to begin. 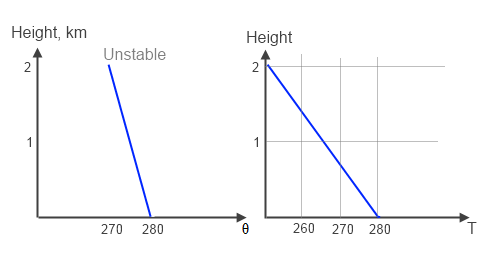 Let’s start with something called the geopotential height. 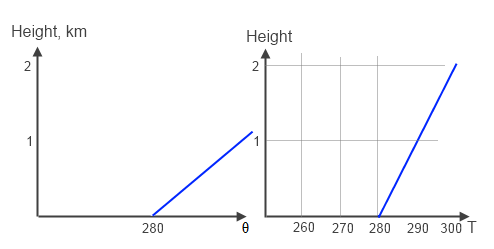 This is the height above the earth’s surface of a particular atmospheric pressure. 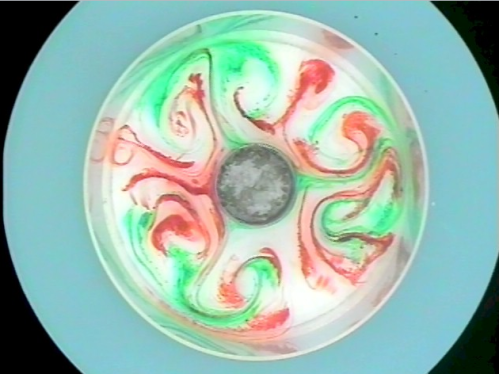 In the example below we are looking at the 500 mbar surface. For reference, the surface of the earth is at about 1000 mbar and the top of the troposphere is at 200 mbar. At the pole the 500 mbar height is just under 5 km, and in the topics it is almost 6 km. 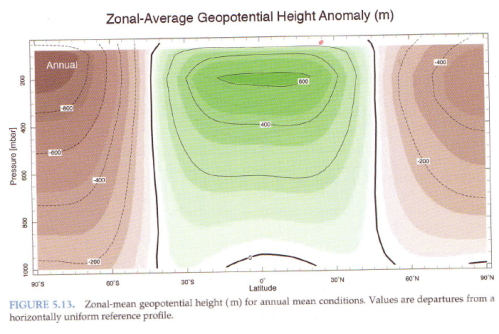 See how the geopotential height increases in the tropics compared with the poles. And see how the difference increases with height. The tropics are warmer than the poles – warm air expands and cool air contracts. This is (oversimplified) like saying that the height of a “geopotential surface” is proportional to the sum of the temperatures of each layer between the surface and that pressure. At 500 mbar, a 40ºC change in temperature leads to a height difference of just over 800 m.
Because of the pressure gradient at altitude between the tropics and the poles, there is a force (at altitude) pushing air from the tropics to the poles. 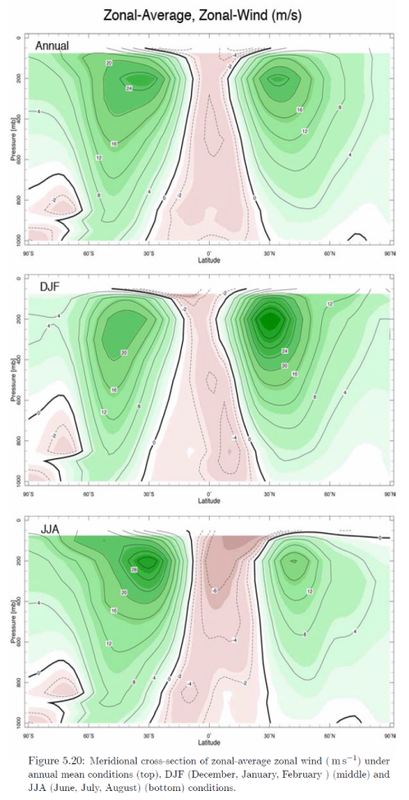 So instead of a circulation extending all the way to the poles we see a circulation from the tropics into the subtropics (note especially the DJF & JJA averages). 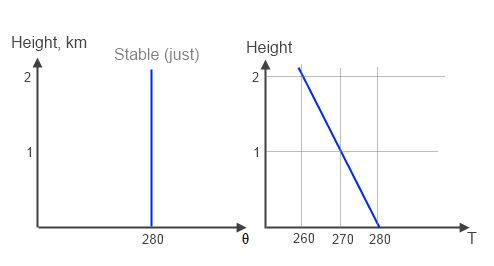 Note that the first example is with slow rotation and the second example is with fast rotation. In both of the above links, make sure to watch the videos. 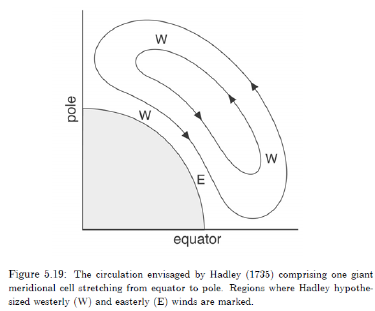 The reason the circulation breaks down from a large equator-polar cell to the actual climate with an equator-subtropical cell plus eddies is complex. We’ll explore more in the next article. 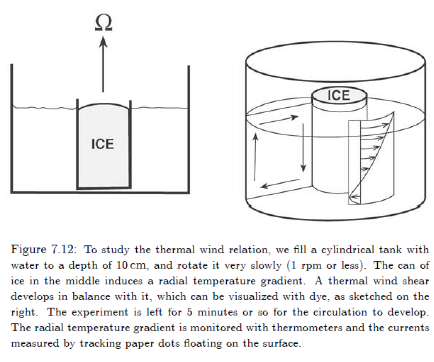 In the next article we will look at the thermal wind and try and make sense out of our observations. In How the “Greenhouse” Effect Works – A Guest Post and Discussion there was considerable discussion about the temperature profile in the atmosphere and how it might change with more “greenhouse” gases. 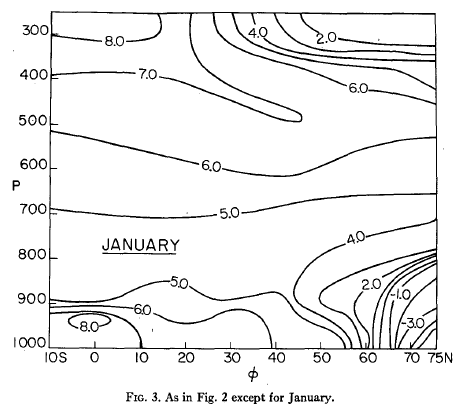 The temperature profile is also known as the lapse rate. 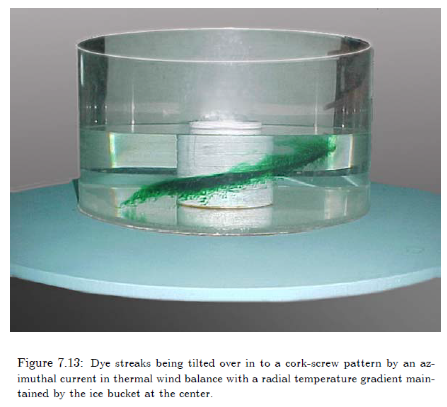 The lapse rate has already been covered in Potential Temperature and for those new to the subject Density, Stability and Motion in Fluids is also worth a read. The graph on the left is the potential temperature, θ, and on the right the “real temperature”, T. The temperature declines by 10°C per km (and this value is not affected by any “greenhouse” gases). The potential temperature is constant. 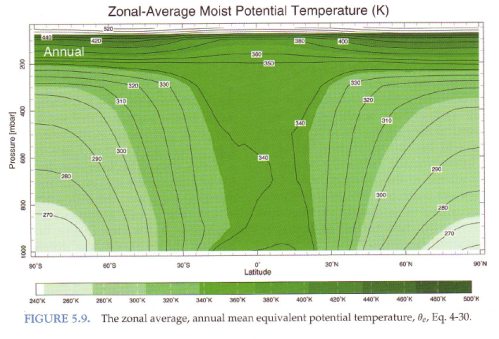 Remember that for stable atmospheres the potential temperature cannot reduce with height. Because the temperature at a given altitude is “too cold”, when any air is displaced from the surface it will of course cool, but finish warmer at 1km and 2km than the environment and so keep rising. This situation is unstable – leading to convection until the stable situation in figure 1 is reached. We can also see that the potential temperature decreases with altitude, which is another way of conveying the same information. 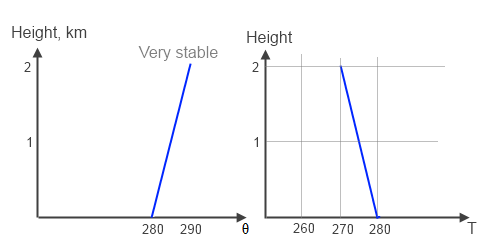 The important comparison between the first two graphs is to understand that figure 2 can never be stable. The atmosphere will always correct this via convection. Exactly how long it takes to revert to figure 1 depends on dynamic considerations. Now the temperature reduces with height, but not sufficiently to induce convection. So a parcel of air displaced from the surface ends up colder than the surrounding air and sinks back down. So how do figures 3 & 4 come undone? 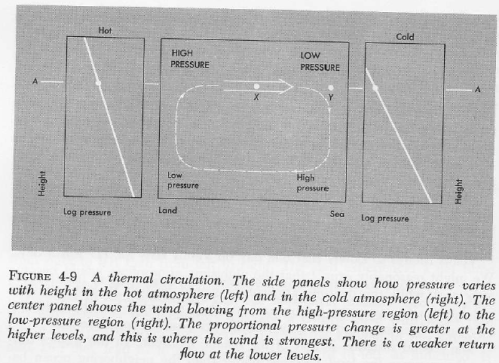 Surely once the atmosphere is stable to convection then it becomes static and heat can only move radiatively from the surface into the atmosphere? The basic principle of heat movement in the climate is that the sun warms the surface (because the atmosphere is mostly transparent to solar radiation) and so the atmosphere is continually warmed from underneath. 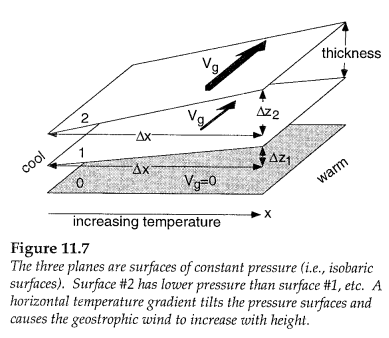 As the surface warms the atmospheric temperature profiles move from a → d. This is a result of convection. But where does all this heat go that was convected from the surface into the atmosphere. 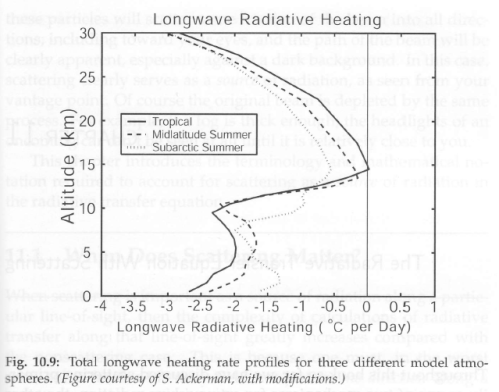 This illustrates that the atmosphere is always cooling via radiation to space – and cooling at all altitudes. So the atmosphere cools via radiation, the surface warms from solar radiation and when the lapse rate reaches a critical value convection is initiated which moves heat from the surface back into the atmosphere. As a minor question, how does a temperature inversion ever get created? It’s a temporary thing. In the case of nighttime, the surface can lose heat via radiation more quickly than the atmosphere. The surface is a more effective radiator than the atmosphere. In the case of the polar winter, the same effect takes place over a longer timescale. But eventually, when the sun comes up, the surface gets reheated. Actually there are a few different definitions for the tropopause. But let’s save that for another day. There is a point at which convection stops. Why? Suppose there was no convection, only radiation. If we consider heat transfer via radiation then there is a change as the atmosphere thins out. Let’s take a massively over-simplistic approach to help newcomers. Suppose a photon of a given wavelength has to normally travel 100 molecules before getting absorbed. In this case, as the atmosphere thins out from 1000 mbar (surface) to 200 mbar (typical tropopause), the same photon would have to travel 400 molecules before getting absorbed. This means that the temperature change vs height reduces the more the atmosphere thins out. As a way of thinking, it’s like the resistance to temperature change reduces as the atmosphere thins out. See how the temperature change with height (the lapse rate) reduces the higher we go. So at a certain point the potential temperature always increases with height, making the atmosphere resistant to convection. The point at which the radiative lapse rate is less than the adiabatic lapse rate is where the atmosphere stops convecting. However, this is not technically the tropopause (note 3). Another way to think about this for newcomers is that the temperature reduction caused by lifting a parcel of (dry) air 1km is always about 10°C. So if the temperature reduction due to radiative heat transfer is 5°C then the lifted parcel is always cooler than the surrounding air and so sinks back = no convection. 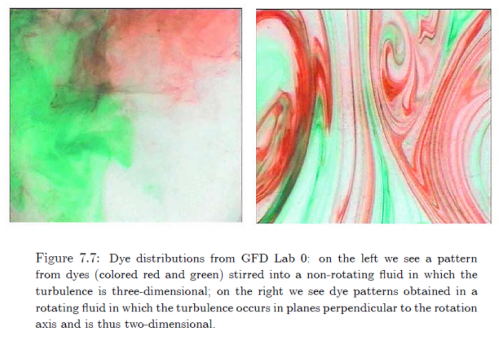 Now the atmosphere is not gray so this is not a simple problem, but it can be solved using the radiative transfer equations with numerical methods. In the tropics the (moist) potential temperature is close to constant with altitude until about 200 mbar. And at other latitudes the potential temperature increases with height very strongly once we get above about 300 mbar. 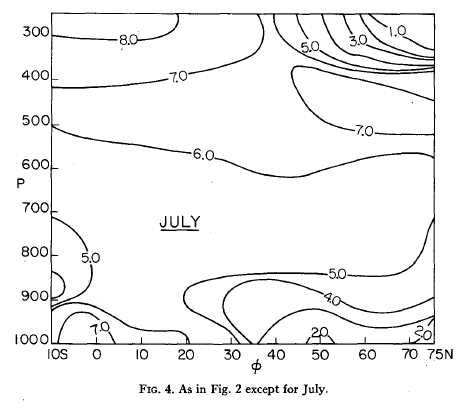 This shows that the atmosphere is stratified above certain altitudes. Let’s consider the simple aspects of more CO2. These got a lot of discussion in How the “Greenhouse” Effect Works – A Guest Post and Discussion. We increase the amount of CO2 in the atmosphere but at the surface the change in downwards longwave radiation (DLR) from the atmosphere is pretty small, perhaps insignificant. 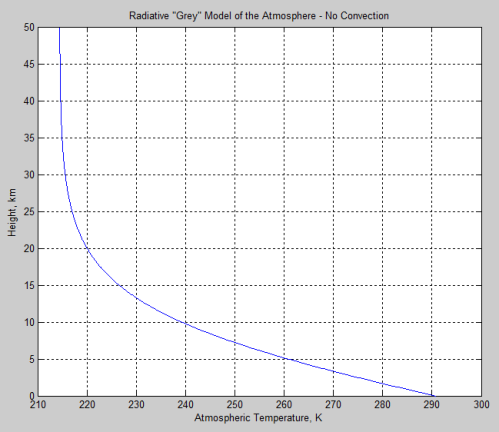 By comparison, at the top of atmosphere (TOA) the radiative effect is significant. 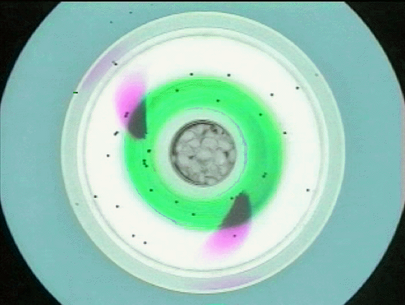 The atmosphere becomes more opaque, so the flux from each level to space is reduced by the intervening atmosphere. Therefore, the emission of radiation moves upwards, and “moving upwards” means from a colder part of the atmosphere. Colder atmospheres radiate less brightly and so the TOA flux is reduced. This reduces the cooling to space and so warms the top of the troposphere. Therefore, there will be less convective flux from the surface into this part of the atmosphere. 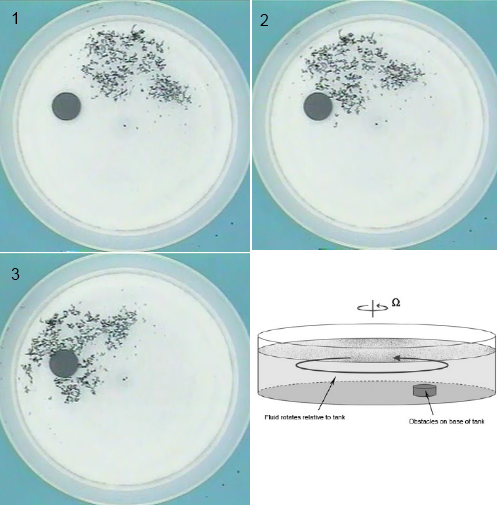 As a result the surface warms. The real world environmental lapse rate is more complex than might be inferred from the earlier descriptions. 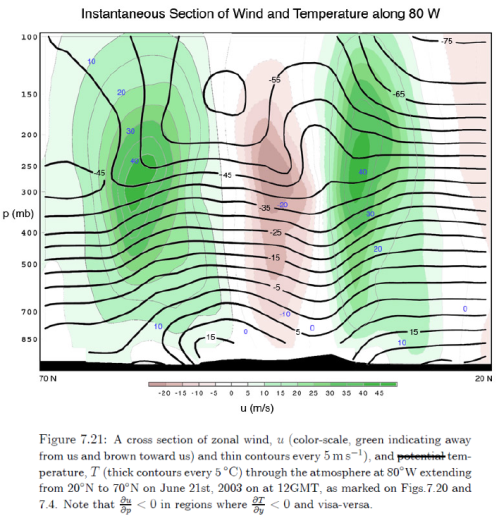 This is because the large scale circulation of the atmosphere results in environmental temperature profiles that are different from the adiabatic lapse rates. The environment can never end up with a greater lapse rate than the adiabatic lapse rate but it can easily end up with a smaller one. And of course, one of the biggest questions in an atmosphere with more CO2 is how water vapor concentration changes in response to surface temperature change. Changes in water vapor have multiple effects, but the one for consideration here is the change to the lapse rate. The dry adiabatic lapse rate is 9.8 °C/km, while the moist adiabatic lapse rate varies from 4 °C/km in the tropics near the surface (where the water vapor concentration is highest). Consider an atmosphere where the temperature reduces by 15 °C in 2km. Dry air moving upwards reduces in temperature by 20 °C – which is colder than the surrounding air – and so it sinks back. Very moist air moving upwards reduces in temperature by about 10 °C – which is warmer than the surrounding air – and so it keeps rising. So more moisture reduces the lapse rate, effectively making the atmosphere more prone to convection – moving heat into the upper troposphere more effectively. (Cue tropical hotspot discussion). Note 1: A parcel of air displaced “quickly” to a new height is written for ease of understanding. Technically, potential temperature stays constant if a parcel of air is displaced “adiabatically” – which means no exchange of heat with the surrounding atmosphere. Note 2: A gray atmosphere is one where the absorption vs wavelength is constant. More technically, this is usually a “semi-gray” atmosphere because the atmosphere is transparent to solar radiation but absorbs terrestrial radiation. 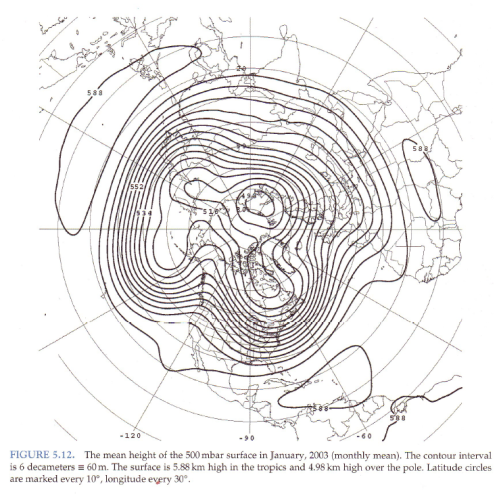 Note 3: The tropopause is usually defined where the lapse rate is at a minimum. 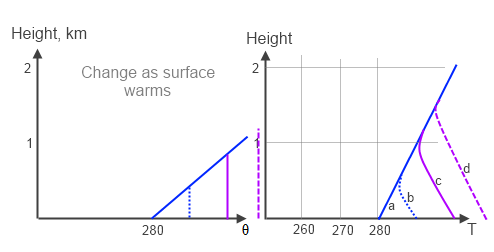 In radiative equilibrium the temperature would continue to decrease with height even after the point where convection stops. It is only the presence of radiative gases (ozone) that absorb solar radiation that cause the stratospheric temperatures to increase.